Puerto Rico’s Pharmaceutical Industry: 40 Years Young! Puerto Rico's Pharmaceutical Industry: 40 Years Young! For almost 40 years, Puerto Rico has been a home to a majority of the major pharmaceutical and medical device manufacturers. In fact, over 100 companies have facilities on this beautiful tropical island, a Commonwealth of the United States. Renowned for its highly educated, innovative, and skilled workforce, extensive regulatory experience, and a rich history of product delivery, Puerto Rico has become one of the largest high-tech manufacturing centers in the United States. And, the future of Puerto Rico remains bright as it focuses on research & development, biotechnology, and its continuation as a leader in drug and device manufacturing. When the first pharmaceutical plant on Puerto Rico began operation in 1957, perhaps few could have foreseen that a few short decades later the island would emerge as one of the world's top manufacturing locations for pharmaceutical and biopharmaceutical products. But that is exactly what has happened. Puerto Rico has benefited from a combination of tax incentives, proximity to the U.S. market and the energy, intelligence and determination of its people, attracting increasing foreign investment in the pharmaceutical, biotechnology and medical device industries. 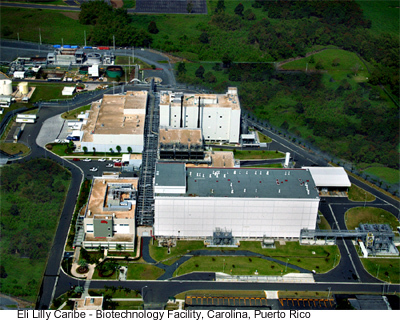 Eli Lilly opened its first plant on the island in 1960, and today the majority of the top 20 pharmaceutical companies, including Abbott Laboratories, AstraZeneca, Bristol-Myers Squibb, GlaxoSmithKline, Johnson & Johnson, Merck, Novartis, Pfizer and Wyeth operate facilities on Puerto Rico. In fact, the island, which now boasts a staggering $60 billion in pharmaceutical industry infrastructure, including 89 FDA-approved pharmaceutical and biopharmaceutical plants, is the world's 5th largest pharmaceutical manufacturing region, after the U.S., the U.K., Japan and France. Despite its unqualified success, Puerto Rico is not immune to the trends that impact the global pharmaceutical industry. The combination of consolidations, patent expirations and a slowing pipeline has put tremendous pressure on manufacturers to rationalize manufacturing and eliminate excess capacity. Several recent closings, such as two recent plant closings by giant Pfizer, which has multiple facilities in Puerto Rico, have grabbed headlines. But the headlines tell only part of the story—because instead of being shuttered and abandoned, both Pfizer plants quickly found new investors to keep them operating. Pfizer's Fajardo plant, which manufactured the contraceptives Loestrin and Nitrostat, was purchased and immediately reopened by Warner Chilcott, a leading specialty pharmaceutical company that develops and manufactures branded prescription pharmaceutical products in women's healthcare and dermatology. "The transition from Pfizer to Warner Chilcott was seamless, and there were no job losses" reported Ivan Lugo, Executive Director of INDUNIV, a non-profit organization that works with industry, academia and government to promote the application of science and technology to Puerto Rico's pharmaceutical and biotechnology industries. "This is all part of a natural progression in the industry. Companies are developing more targeted products that typically require less manufacturing capacity. But while Puerto Rico is seeing some pharmaceutical plant closings, these are being more than offset by the increasing investment in biotechnology." The history of Pfizer's plant at Cruce Davila, Barceloneta also illustrates this trend. The plant was acquired as part of Pfizer's $60 billion acquisition of Pharmacia, which added Pharmacia's four facilities in Arecibo, Caguas and Cruce Davila to Pfizer's plants in Fajardo, Vega Baja and Barceloneta. The Cruce Davila site housed two manufacturing facilities; a 172,00 square foot validated manufacturing plant capable of producing EU and US compliant injectable pharmaceuticals, protein-based biologics and metered dose inhalers, and a state-of-the-art, 90,000 square foot API manufacturing plant where the company manufactured an active ingredient for the blockbuster drug Celebrex. When Pfizer evaluated its integrated global plant network, it was decided that while the API plant was still a valuable asset, there was no longer any need for the biologics manufacturing capacity. The company has since inked a deal with Abraxis BioScience, Inc., which will purchase the entire site and lease the API facility back to Pfizer. The purchase will provide Abraxis with a third manufacturing facility to produce chemotherapeutics such as Abraxane, using the company's proprietary nanoparticle albumin bound technology. The Abraxis facility is expected to employ between 300 and 400 people when it becomes fully operational. The resiliency of Puerto Rico's pharmaceutical industry is due to many diverse factors, including an attractive business climate. With a 40-year history of manufacturing, the island's pharmaceutical industry is mature and extremely well integrated. "All of the elements are in place in Puerto Rico," added Mr. Lugo. "This is not always the case in emerging markets." Manufacturers can take advantage of Puerto Rico's existing infrastructure, which includes state-of-the-art digital, fiber optic and satellite communications, one of the busiest container ports in the Western hemisphere, 40 shipping lines, regional and international airports that handle more than 4,000 cargo flights per month, a modern network of superhighways that ensure no location is more than two hours from an airport or seaport, and 5,359 megawatts of diversified electrical generating capacity. They can also count on Puerto Rico's seasoned suppliers and service providers, including many contract manufacturing and packaging companies. A well-educated, highly motivated workforce also makes Puerto Rico competitive in the global marketplace. "Our workforce has over 40 years of FDA experience," Lugo stated. "The education level is among the highest in the world, comparable to that of pharmaceutical industry workers in the U.S. And these are dedicated employees. Worker absenteeism is very low, and salaries are ten to thirty percent lower than on the mainland." Industry ties to Puerto Rico's universities are strong. More than 9,600 scientists graduate from the island's universities each year, many of whom have participated in internship programs as undergraduates. The University of Puerto Rico has received funding for a 152,000 square foot Molecular Sciences Complex that will house faculty and incubator space for a range of bioscience-related disciplines. In addition, a new $12.5 million Biotechnology Center for Research & Training in BioProcesses will begin construction near the University of Puerto Rico campus. This 28,751 square foot facility will house a pilot plant and suites for mammalian cell culture and microbial cell fermentation as well as a business incubator and contract production. Puerto Rico's geographic position provides a tremendous competitive advantage. Only 2-3 hours away from the world's largest pharmaceutical market, it is no surprise that 80% of the drugs produced on the island are consumed in the United States. As a US territory, Puerto Rico is homeland secure and compliant with U.S. intellectual property laws. Puerto Rico's compliance positioning is also excellent. All plants are FDA approved, and the workforce is also highly experienced in working with U.K., European and Asian regulatory agencies. U.S. tax incentives played a large role in creating Puerto Rico's pharmaceutical manufacturing cluster. And although the tax incentives of Sections 936 and 30A of the Internal Revenue Code were phased out at the end of 2005, the island's manufacturers can still benefit from some of the best tax incentives in the world, including no U.S. federal income tax and a local corporate income tax rate that tops off at 7 percent. By comparison, Ireland, another low tax manufacturing region, has a corporate income tax rate of 12 percent. Most of the former Section 936 companies have converted to 901 CFC, which converts US companies operating in foreign countries into controlled foreign corporations, or CFCs. This strategy allows manufacturers to enjoy the benefits of operating within a U.S. jurisdiction, with the added tax benefits of operating under a foreign tax structure. It has also helped many facilities to become more productive with state-of-the–art automated systems. Under Section 936, which included wage credits, a typical packaging line was operated manually, by 35 or so employees. Now, under 901 CFC, it is not uncommon for automated lines to be operated by as few as ten employees. Puerto Rico's government has made growing the island's biotechnology industry a priority, creating a range of new tax incentives for R&D, process development, scale-up and manufacturing. In December 2003 the government approved legislation granting a 200% deduction on qualifying R&D spending activities for new or improved products. In an effort to attract more emerging companies to Puerto Rico, the Commonwealth is also creating a tax package tailored to the needs of companies that are at the stage of net operating loss. Puerto Rico has already managed to attract several of the biotechnology industry's biggest players. Amgen, the world's largest biotechnology company, has made tremendous investments in Puerto Rico, and expects to invest another $1 billion over the next four years to expand its manufacturing capacity on the island. The company will expand its existing manufacturing complex in Juncos, and build a new formulation, fill and finish facility. Amgen also expects to add approximately 500 employees in Puerto Rico by 2010. Other biotech companies with a presence in Puerto Rico include Eli Lilly, Ortho Biologics, Abbot Laboratories and Abraxis BioSciences. In addition to biotech, the island's flourishing medical device cluster is now one of the largest high tech manufacturing centers in the United States. Major medical device companies such as Baxter, Medtronic, Stryker, Becton Dickinson, U.S. Surgical, Unilever, Roche, and Guidant have all made investments in Puerto Rico. 50 percent of all pacemakers and defibrillators sold in the U.S. mainland are manufactured in Puerto Rico, and the island's manufacturers shipped more than $2 billion worth of medical/scientific devices in 2003. The technology and professional education needs of Puerto Rico's life science industry clusters are supported by INTERPHEX Puerto Rico, the island's resource for innovative strategies and solutions for every phase of pharmaceutical manufacturing from process development through delivery. As the island's largest industrial gathering, INTERPHEX Puerto Rico will take place February 1-2, 2007 alongside MEDICAL DEVICE Puerto Rico and Supply Chain & Logistics Puerto Rico at the Puerto Rico Convention Center in San Juan. INTERPHEX Puerto Rico features an exhibition hall where the island's pharmaceutical manufacturing professionals can have convenient access to the latest innovations from more than 300 of the industry's leading suppliers, including such companies as Lancer USA, Getinge USA, and MG America (all Gold Sponsors of the event) as well as Indusa, Invensys, Honeywell HPS, Pall Life Sciences, Nilfisk-Advance America, Laminar Flow, Mettler-Toledo/Hi-Speed/Safeline, Praxair Distribution, Saint-Gobain Performance Plastics, Rockwell Automation, Sartorius Corporation Biotechnology Division, Steris Corporation, Tyco Valves, Washington Group International, Wave Biotech, Zebra Technologies and many more. The INTERPHEX Puerto Rico 2007 Conference, developed in conjunction with a conference advisory board composed of local industry experts, will feature tracks on regulatory issues, manufacturing technologies, facilities & engineering, biotechnology and packaging. Attendees may purchase a One-Day pass, a Full Conference pass that provides access to all sessions on both days, including all sessions of the MEDICAL DEVICE and Supply Chain & Logistics conferences, or an Exhibits Plus pass that provides admission to just one conference session. The event also features a variety of special features, events and activities that enable the members of Puerto Rico's dynamic life sciences industry to meet, share ideas and insights, and form new relationships that can help advance their careers. Highlights of INTERPHEX Puerto Rico 2007 will include daily Fiesta Hours on the show floor, an Opening Night Reception, a Cyber Café, ISPE Member Lounge, and a Golf Tournament sponsored by the Puerto Rico chapter of ISPE. INTERPHEX Puerto Rico is sponsored by ISPE and Pharmaceutical Processing magazine, and enjoys extensive support from the island's many industry organizations, including INDUNIV; PRIDCO; PRTEC, Puerto Rico's Technoeconomic Corridor; the Puerto Rico Manufacturers Association; the Puerto Rico Convention Bureau; CIAPR, the School of Engineers and Surveyors of Puerto Rico; and the Puerto Rico Small Business and Technology Development Center. "The skilled production, educated workforce, nearly 50 years of success and passion for winning within such a competitive global pharmaceutical marketplace will continue to drive Puerto Rico as a leader in drug manufacturing," stated Kevin Richards, Group Vice President for event producer Reed Life Sciences, a division of Reed Exhibitions. "To be ranked 5th in the world after the U.S. mainland, the UK, Japan and France speaks for itself about Puerto Rico. Our Puerto Rico events team at Reed is honored to have developed key partnerships, phenomenally successful events and many friendships in Puerto Rico." INTERPHEX Puerto Rico is part of the INTERPHEX family of global events, which includes INTERPHEX New York as well as events in Mexico, Singapore, India and China. For complete event details and convenient online registration, please visit www.interphexpuertorico.com. Kevin Richards has over thirteen years of experience in the events and trade show industry. The past seven years he has been focused within the pharmaceutical, biotechnology and medical device sectors at Reed Exhibitions (RX). Kevin has a distinguished record of achievements at RX with honors of 2002 President's Award, Sales Executive of the Year, Sales Manager of the Year and twice given the Sales Director of the Year award. He has utilized his events and trade show sales and management experience leading some of RX North America's largest events including the INTERPHEX pharmaceutical group, all Life Science event launches and the business development in Puerto Rico. Kevin has been a Vice President at RX for nearly seven years. Kevin and the strong teams he has managed have been very involved in building the life sciences group since the Fall of 1999 with over twelve new launches in that same period of time. In January of 2006, Kevin was appointed Group Vice President for Reed Life Sciences Group, the Americas. Kevin attended Michigan State University and Central Michigan University and holds a Bachelor of Science degree in Business Administration from Central Michigan University with majors in Marketing and Finance. Kevin and his wife, Wendy, and their sons live in Stratford, Connecticut.